Sesame® | The brand you trust for corrugated packaging and plywood composing reinforcement. Sesame | The premier brand of adhesive coated solution for corrugated and folding carton packaging and plywood composing. Sesame Tape: Sesame Tapes are available for wet and dry end application, and are used for containment and reinforcement of bins, boxes and trays. It is used to reinforce critical stress areas of boxes such as handles and handholes and is used inconjunction with Open-Sesame tape as the guide tape to create the clean tear. Sesame High Modulus Tape: The unique technology of the Sesame High Modulus Tape gives superior performance and strength for bottom sag reduction, extended endurance in supply chain, bulge resistance, compression improvements or increased reusable packaging life. Sesame High Modulus Tape technology also helps you in meeting your cost savings and sustainability goals by reducing losses from unsaleable products, reduce product claims with potential to lower board weights. Sesame High Modulus Tape is used for reinforcement in bins, boxes and trays. Sesame Kraft Backed Tape: Sesame Kraft Backed Wide Tape is used where customers want to visually see tape reinforcement and for high quality litho printed boxes where external graphics are important. The narrow version is used for opening applications. 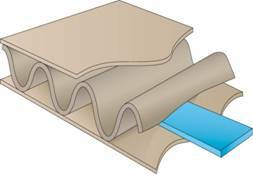 This solution is designed to pull entire tape through the corrugated box when opening the tear tab. It will allow you to access to box contents without concern for tear quality. The tape is reinforced so that you can be assured it is strong enough to pull through corrugated without breaking. Sesame Specialized Reinforcement Tape: Sesame Specialized Reinforcement Tape is a wide tape used to reinforce large boxes in critical stress areas. It can be used to strengthen the top lift flanges of appliance boxes, reinforce the entire area around the access hole. It can also be used to reinforce large boxes for bulge and sag. and folding carton applications. It is used for vertical scoreline reinforcement and can help extend the reuse of multitrip containers. Sesame String is the most economical option. It is typically not as strong as tape, so it is used for lighter products where limited reinforcement is needed. Open-Sesame Tapes: Open-Sesame tape is used to create retail ready packaging solutions. You can create a premium clean tear solution by using the Open-Sesame two tape System. It utilizes an Open-Sesame tape which is applied on the top of inside liner of the box in conjunction with a Sesame Tape inside the board. The scissors tearing action of the tapes creates the optimum clean tear solution. Using Open-Sesame as a one tape solution can also provide a good tear, especially in lighter weight boards. Close-Sesame™: Close-Sesame is an effective closure system for corrugated packaging and works well for hand packed boxes with uniquely shaped contents. The simple in-line application on the dry end offers production efficiencies for corrugated manufacturers. Cutting Edge™: Cutting Edge creates a safe, finger friendly edge to cut and dispense foil and paper productions. It is used for both corrugated and folding carton applications that need a serrated edge and eliminates the need to apply the metal strip in an offline process. 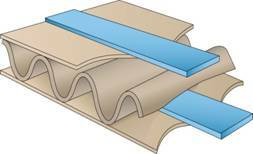 Sesame Veneer Tape: Sesame Veneer Tape is used to compose veneer sheets. It holds together smaller pieces of veneer to make large sheets of veneer. These products help plywood manufacturers reduce waste, maximize wood yield and production efficiency all leading to increased mill profitability. 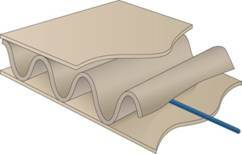 Sesame Veneer String: Sesame Veneer String can be used by itself, or in conjunction with onsite hot melt to compose veneer sheets. This product helps plywood manufacturers reduce waste, maximize wood yield and production efficiency all leading to increased mill profitability. Sesame Green Veneer: Sesame Green Veneer Tape is specially formulated to compose veneer while it is wet. 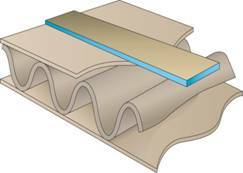 The tape is heat activated during composing, but is design to maintain bond through the veneer drying process. This tape is versatile enough to be used for either wet or dry composing. Sesame Hot Melt Adhesives: Hot Melt adhesives are designed to be used for on-site composing process when combined with uncoated yarn. Used For: Reinforcement to ensure containment for improved bulk bin performance.